I must say I have started to have an obsession with Lush products. What’s not to love when it smells so Lush. After having a busy day I was really excited to try out this bath bomb. I’m definitely not unfamiliar with the Lush products, I’m practically there every pay day, but I haven’t tried this one and it smelled gorgeous when I walked into the shop. After a long day at work I was really looking forward to using this and I wasn’t disappointed. The bath bomb has a nice jasmine, ylang ylang and clary sage scent which instantly relaxes you. The smell is quite sweet and rosy but not too overwhelming. It leaves the bath a nice rosy pink colour which in my opinion, is a must from a bath bomb. I just love it when the bath bombs change the bath all colourful, when they just fizz it's not as exciting. Anyhow, I'd definitely recommend this bomb just to relax and have a nice pamper night. Also to top the bath off I'd recommend using a bit of Lush bath bar, they have many which would go perfectly with this. Im currently using the Pop in the Bath but they have planty more. 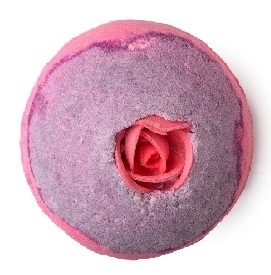 Here's a link to their bath bars, https://www.lush.co.uk/products/bubble-bars#showall, hope you found this helpful. Don't be afraid to comment if you found this helpful.